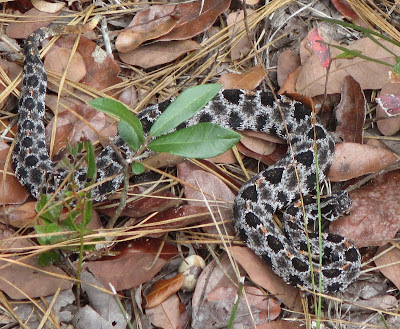 The Dusky Pygmy Rattler may be small, but there's no 'back down' in this character. For the second day in a row I learned about a significant Florida species by first hand experience. I'd read the basic trail precautions about venomous snakes, but I never got past 'rattlesnake'. If it has a rattle, watch out. The distinctions between the Dusky Pygmy and the more widespread Eastern Diamondback and Timber Rattlers escaped me. But except for the rattle, which on this guy did *not* make any sound when shaken, this species looks nothing like its larger cousins. Full grown Dusky Pygmies are less than three feet long. This one looked to be about as large as they get. The coloration is striking, particularly the bright yellow-brown dorsal patches, which includes a long stripe right behind the head. The head is oddly shaped - the face particularly alien looking. When threatened, this one bobbed its head up and down in quick little jerks at the same time that it was shaking its silent rattle. And despite its diminutive size, there was no indication that this one was prepared to flee. It stood its ground. It was I who eventually retreated. My retreat took me on through Farles Prairie where I encountered much more sociable company: Here are Florida Trail enthusiasts Lisa, 'Longwalker', and 'Trucker Bob' - he of the impressive beard. We had a great chat and exchanged photo ops. Later in the day I met Juli and Bonny, section hikers who I'd passed and had quick casual exchanges with on each of the past two days. Today we met twice and had much more substantial conversation. Juli lives very near the Mountains-to-Sea Trail in central North Carolina, and she had done trail building along the Haw River and maintenance around Falls Lake. Thank you, Juli! She was down in Florida visiting long-time friend Bonny and enjoying some warm weather winter hiking. 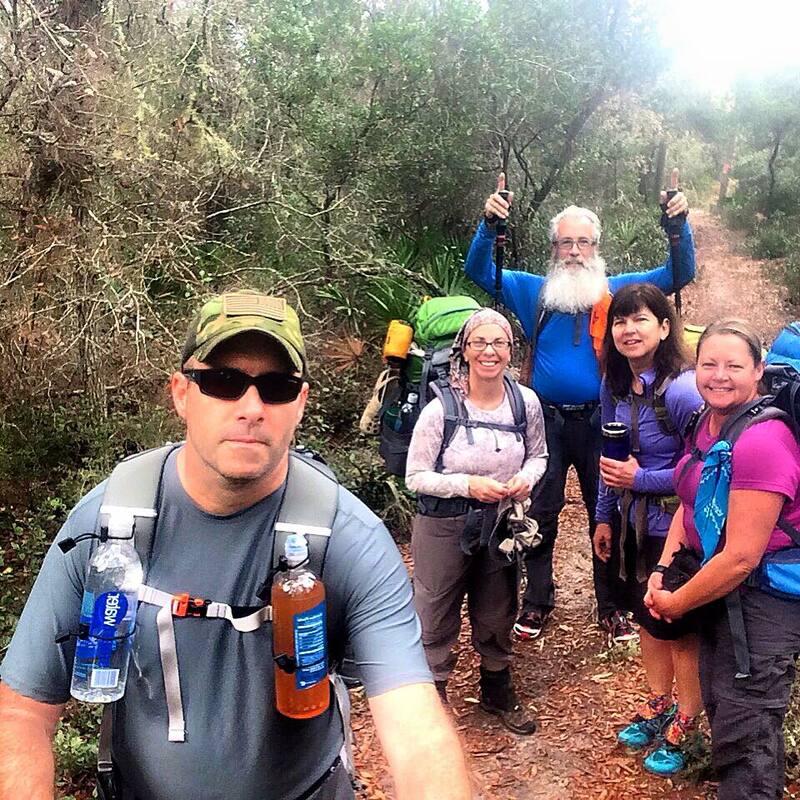 I didn't get my own photo, but 'Longwalker' got this group selfie when they met. I'm stealing this shot from him. Juli is the one with the dark hair, Bonny's the blond. Farles Prairie is not as extensive as Hopkins Prairie, the grassland that impressed me so deeply as I traversed it a few days ago, but it was a wonderful change from walking in the woods. It has a more substantial lake than Hopkins. And I came upon this striking 'purple patch'. For me the whole twenty mile day was one ongoing 'purple patch' (a British colloquial term for a run of good luck). Hope it continues!